While Medion has released previous netbooks to mild acclaim, its latest model brings increased storage and Microsoft's Windows 7 OS to the table. With so many rivals, however, the Akoya E1217 struggles to stand out. 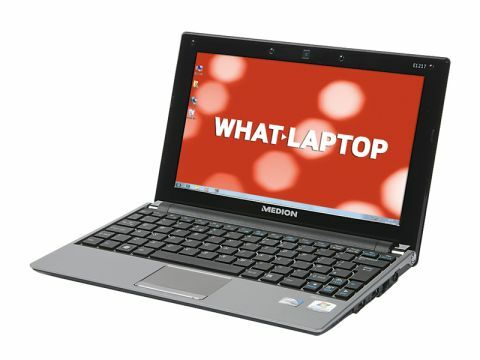 Although other netbooks, such as the Acer Aspire One 532 and Asus Eee PC 1201N, utilise cutting-edge technology, Medion has instead opted for an older Intel Atom processor. While this helps keep costs down, it also delivers lower performance and mobility. While the Acer and Asus provide 344 and 265 minute battery lives, respectively, the Medion only managed 195 minutes. This is standard for the last generation of netbooks, however, and allows basic mobility at home or on shorter journeys. Performance is equally standard fare for the previous netbook generation but, in some cases, is doubled by the latest crop of mobile processors. Netbooks were originally designed for internet browsing and basic home office use, however, and the Medion succeeds in this respect. The keyboard utilises the popular isolated-style, with each key cut through an individual hole in the chassis. This provides ample space between the keys, and we found it comfortable to type on. The use of a 10.1-inch screen keeps the weight down to a highly portable 1.1kg. Image quality is fantastic, with the panel proving extremely bright and colourful. As mentioned earlier, the use of Windows 7 software brings the latest features and greatly improved usability over past Windows XP-equipped netbooks. The 250GB hard drive also betters the usual 160GB disks of older netbooks, and provides ample storage for media files. On its own merits, the Akoya E1217 is a likeable, if unexceptional, netbook. With the latest crop of netbooks vastly outperforming it, however, it looks a little outdated compared to rivals, such as the Asus Eee PC 1201N, but its lower price and great usability mean it certainly still has plenty to offer.